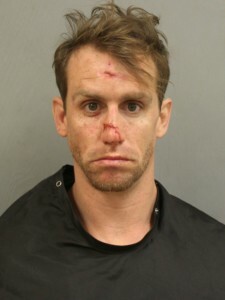 KERSHAW COUNTY, S.C. – (WOLO) – Kershaw County Deputies say a man with a lengthy criminal history told a deputy he wasn’t going to jail and the deputy would have to shoot him to get him into custody. Adam Wayne Lyles, 32, of Eastover is charged with failure to stop for a blue light, possession of methamphetamine and driving under suspension following a lengthy vehicle pursuit. Sheriff Jim Matthews said a deputy was attempting to give Lyles a warning after stopping him for driving with a broken headlight. Things escalated when Lyles allegedly told the deputy that he wasn’t going to jail and sped away. The pursuit ended along US 378 in Richland County when Lyles crashed into a tree and his vehicle caught on fire, say deputies. Lyles was treated at the scene for injuries sustained in the collision and was transported to Kershaw Health hospital before being taken to the Kershaw County Detention Center, say Deputies. Lyles has previously been arrested for distribution, sale, manufacturing or possession with intent to distribute drugs near a school; three charges of manufacturing, possession with intent to distribute drugs and driving without a license, according to the Sheriff.